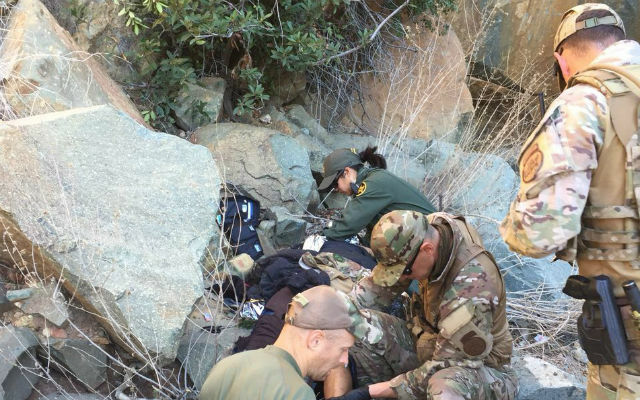 Border Patrol and Air and Marine Operations agents rescued a seriously injured Honduran woman in the Otay Mountain Wilderness east of San Diego. The rescue occurred around 5:30 a.m. on Wednesday when agents apprehended a man from Honduras who had crossed into the United States illegally. The man told agents that he was traveling with a woman who fell into a steep canyon hours before he was arrested. Border Patrol agents immediately initiated a search for the woman, calling in a Pilatus PC-12 fixed wing aircraft and an AS350 A-Star helicopter. The helicopter crew spotted the woman and guided agents to her location. Another helicopter, a UH-60 Blackhawk, was sent to evacuate the woman, taking her to Brown Field where an ambulance was waiting. “If not for the quick response by Border Patrol agents and the skillful air search and helicopter hoist extraction by Air and Marine Operations agents of this seriously injured woman, she would have perished on this mountain,” said Hunter Davis, San Diego Director of Air and Marine Operations for Customs and Border Protection. Agents determined the woman is a 31-year-old Honduran national who had illegally crossed into the United States.